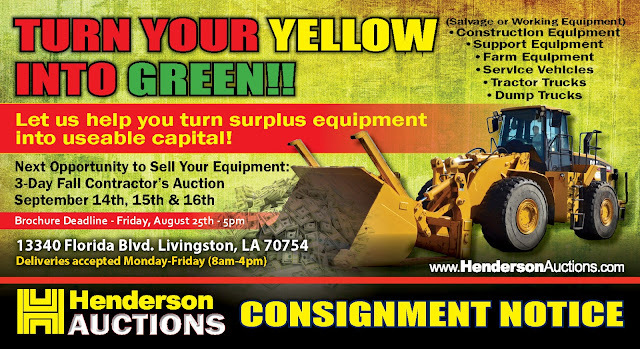 Henderson Auctions...a family owned business since 1957: "Turn Your Yellow Into Green" at our Next Auction! "Turn Your Yellow Into Green" at our Next Auction! "Turn your Yellow into Green"
I know this sounds a little corny but if your in the heavy equipment industry, you get this turn of phrase and although it borders on the gimmicky side, its true! Henderson Auctions would love the opportunity to prove the auction method of selling your equipment. If you have never used an auction company to sell your equipment, you are simply missing out on an untapped resource. 1. "Need for Speed" if you want to turn your equipment into useable capital fast, auctions are the perfect solution, sellers receive a check two weeks after our auctions. 2. Drop the Insurance on your vehicles as soon as they arrive at our yard and save that monthly payment. 3. Marketing is done! We take care of all the advertising for your equipment in trade publications, digital venues and social media at no additional cost or headache to you. 4. If your not in sales, handling the influx of calls and previews for equipment can become time consuming and doesn't guarantee a sale. Henderson Auctions handles all the sales activity for your equipment, leaving you the time needed to promote and increase income potential in your business! 5. Sellers get their equipment in front of worldwide buyers. We use multiple online auction platforms to get the highest net yield from the most diverse customer base. 6. Our goal is to make you a lifelong customer and friend, we are not here to make a fast dollar off our buyers and sellers. We cherish our customers and treat them like family. 7. We make it easy...we charge a fair commission for superior service. Sellers simply drop off their equipment at the auction location and we do the rest! Visit our website for all our upcoming auction dates!